Last week, I told you all about my lovely friendship with Kathy, who is one of the most enterprising and talented vegan chefs I know. I also alluded to a special project that Kathy and I were cooking up, which I’m ready to unveil today: The Kathy and Gena show! Yes, that’s right: I’m banishing my camera-shy side to the curb. All of you who’ve asked me to do cooking videos, your wish is granted! Now you get to see just how goofy and awkward I am in person. Of course, none of this would ever have been possible without Kathy, who is a tech mastermind and has the patience of a saint. In spite of the fact that we faced a number of tech issues in this, our first video, Kathy plugged away at the editing process and left us with two fun, entertaining, and beautifully put together videos. Kathy, you are amazing! Thank you for this, and for your watermelon frosty recipe, which is possibly the best thing I’ve tasted this summer so far. Excited yet? I hope so!!! Todays featured recipes include two CR classics: my hemp hummus (which appeared on the blog this week in some cute zucchini wraps) and my massaged kale salad with outstanding miso sesame dressing, which I’ve eaten nearly every single day for a week! It also includes Kathy’s amazing frosty and photos of her bruschetta trio, which didn’t make it onto the video intact, but were absolutely delicious. The recipes can be found in Kathy’s recap! Our recipes come together in this amazing wrap: the GK wrap! Stuffed full with hummus, kale salad, mango chunks, and shitake mushrooms, it’s a cornucopia of flavor and texture! Wrapped to perfection by the wrapmistress herself, Ms. Kathy. Enough talk: it’s time for you to see for yourself how all this stuff comes together. Let us show you! Video 2: Kathy’s Watermelon Frosty! That’s it, guys! The “real me!” As you can see, I’m more of a goofball than the measured prose would suggest! 1) Place the hemp seeds in the bowl of a food processor and grind till powdery. 2) Add the chickpeas, salt, lemon, garlic, tahini, and cumin, and begin to process. Add water in a thin stream (stopping to scrape the bowl a few times) until the mixture is smooth and creamy. 3) Garnish with hemp seeds and serve. 1) Blend all ingredients together on high. Add more water if the mixture is too thick. 2) Add about 1/3-1/2 cup of the miso dressing to the kale. Using your hands, “massage” dressing into salad well, till it’s a little wilted in texture. 3) Add tomatoes and peppers, and toss. Serve! And now, time for some feedback! What do you want to see more of from the Kathy and Gena show?? We’re so excited about future episodes and want to take reader requests. Send them now!! And now, I’m returning to what has been a so far blissful first day home in NYC. Tomorrow morning, I’ll start recapping all of my dining adventures for you!! See you then. WOOOO! Lahve. Once I am done visiting the Grams I will watch these like it’s my job. 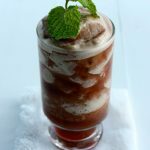 I can also be a bit of a watermelon hater, but I agree that this recipe looks like ti might be the one that gets me to like watermelon! It’s not a fruit that I ever would have imagined would be good in frosty form, but the recipe does look genuinely delicious. I feel like a canteloupe-banana version good potentially be really good as well…. Hope all is well in GenaLand! And I hope all is well with you, Caronae! Great (and fun!) videos! And so nice to “see” you in action! Ah, it all looks so good! And you both have a wonderful vegan glow. That sounds cheesy–ahem, CORNY, since you’re vegan–but it’s true. You’re both gorgeous. I want to make that dressing, like…yesterday, because sweet and salty is my all-time favorite combination. And because I love anything with miso. And yes, I would love to see more videos! You’re so educated on nutrition, that I think (in addition to more food preparation videos) you should do a segment on some of the frequent nutritional questions you get asked. Awww, vegan glow! Thanks Jen. Ah ha! I’ve been massaging the kale and then adding the dressing…whoops! Great pro tip delivered through a fun medium. Wow, great videos, thanks! It’s fun to see the recipes in action and watermelon frosty looks amazing! For videos, maybe commentary on current news and events, kitchen organization, and shortcut tips and tricks. Right on, ladies! “Teach them through food.” – Who would refuse learning that way??? Thats for the videos! Looking forward to more, I never knew how to wrap a wrap! 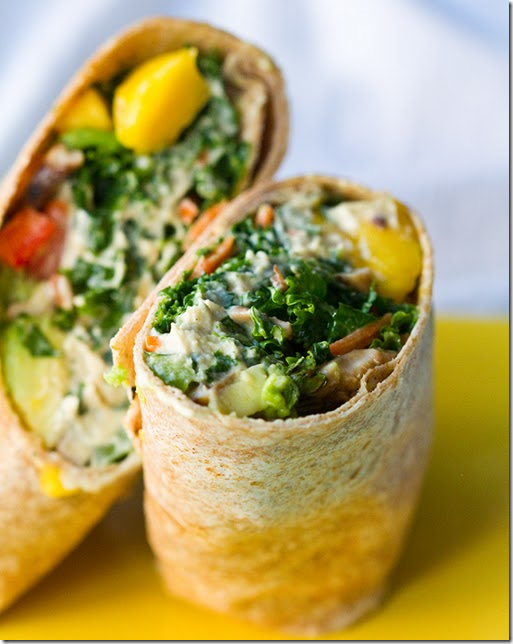 And that wrap looks so yummy! And watermelon is my fav! WOW Congratulations on your first videos =) The wrapping technic is really helpful, loved it! thanks! What brand of wraps did you use? I have the hardest time finding vegan wraps that don’t fall apart (sorry Ezekiel wraps, but that’s you), don’t taste like cardboard, and aren’t full of chemicals. Thanks for the dinner inspiration – while not a proper wrap, your video reminded me I have some much neglected rice paper wraps in the pantry. So I whipped up some broccoli/carrot slaw with your smoky avocado dressing and added some grilled veggies. YUM! Speaking of wrapping things, I’d love to see some sushi wrapping in a future episode! Or some raw-vegan desserts! Great to see you in action, gorgeous girls!! And you made me miss kale, I just have to wait until autumn/winter as that´s the only time it´s available here. Those look so good! I can’t wait to try them. I’ve been vegetarian for over a decade but am trying out a “vegan month” and it’s pretty exciting to see all the great options. Awesome videos! Thank you! Looking forward to more. P.S. I’ve eaten vegan (minus honey) for 3 wks now and it has been super easy and I feel stronger than ever! Amazing! You are such a goofball, and I love you for it. I also adore how massaging the kale can seem oh so dirty when you really think about it. Ahhh! This is really great. Very exciting. And you know what? I think the reason eating raw kale has always given me intense stomach pains is because I wasn’t doing the massage part right. I thought I was, but I actually think I was completely skimping on the dressing. So thank you for this! I am definitely going to give it a try, especially since miso-tahini dressing is my current obsession. P.S. Sorry this is off topic, but I wanted to share that my colonoscopy and coeliac results came back, and all clear! No coeliac! Yay! HOORAY!!!! Sarah what great news. I’m all for food allergy awareness, but as I watch so many people (often those who do not have celiac) give up whole grains, I often feel that it’s a shame, because spelt, farro, and sprouted wheat all do confer real health benefits and aid in satiety and elimination. Here’s to your being able to enjoy those health-giving whole grains without fear. My thoughts, exactly, Gena. I’m especially happy to still have oats, spelt, barley and rye in my life. I had some sprouted spelt toast with avocado to celebrate! Aww I loved this! Your voice is so much different than I thought. And I loved the quirky-ness of it-all the mistakes are refreshing and organic-so don’t worry about making it super polished because it would lose the beauty of the “naturalness” of your videos-if that makes sense! I would love to see a video on your favorite eateries in NYC (or that could just be a post) because I’m going there in the end of July-and I want to go to all the best raw/vegan restaurants out there!!!! Haha…I loved the videos! 😀 I want to make hat frosty sio badly but bananas don’t quite work well with my GI system and you said its necessary 🙁 Any suggestions? Yay for DC area bloggers! And Kathy’s watermelon frosty…oh that is SO ME! I can’t wait to make this once I’m back home and moved into my new home. And I can’t believe you were a watermelon skeptic til now! Love the tag team videos, ladies. Keep them up, ok! Gena! You are ADORABLE in person! Such good food, and such good instruction! I thank you for all of this! Cooking demos are the best. Maybe you could do some reader question and answer videos next! LOVED the videos 🙂 I want to make the kale salad asap!!!! Genaaa, I have to say, you’re the best! Love the videos, and it’s fun to see a real life persona after having real your marvellous prose. You’re a cool chick! Also fun to see some real life examples of proper kale massaging, step by step, in ‘real’ life. Love it!! So great! Love to see the yummy vegan treats and the confident, fun gals…one more reason that this is my favorite blog. LOVED the videos! The mystery of “massaging” finally revealed!!! Would love to see some tips/recipes with nori and other sea veg? You girls are amazing! Thanks so much for braving the camera and doing some ‘real life’ introductions! Seeing you guys make those dishes somehow makes them all the more accessible to me- I feel very inspired right now! LOVE, LOVE, LOVE the videos! Please keep em coming. 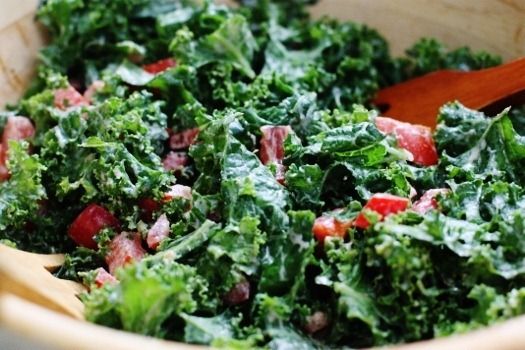 I made the kale salad last week and I totally did it wrong. I had no idea why it wasn’t wilting, LOL. So thank you for that. And now I have to get to Whole Foods ASAP to get watermelon. What are you doing to me???? Plus, I think you need to own this TV personality thing. You were great! Adorable, Gena! Loved the detailed kale massaging and wrapping the wrap demos, especially. It’s so fun watching you two have so much fun together too…good girlfriends are precious, no? What a great post! LOVED the videos. Thank you so much! I enjoyed your videos. Please keep them comimg. I LOVED the videos! It really helps to see you make the dishes because a lot of the time I just assume that it’s difficult to make because they look so awesome, but then when I see it, I think, “I can do that too!”. Looking forward to the next one. Thanks for the great demo on how to make a massaged kale salad! I was wondering if you might be able to write a post containing ALL possible dressings for such a salad. 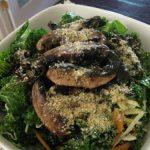 I am not a big fan of tahini/lemon/sesame-based dressings (and even tried one last week from Oh She Glows), but I REALLY want to like raw kale! Also a question: I have learned to eat melons alone as separate food group for correct food combining to improved digestion adding them with sour and acidic of the lime and eating/drinking it so cold sounds like a digestion challenge? I don’t follow food combining, Jelle, but strict food combiners do consider melons in the “eat it alone or leave it alone” category — which would mean not eating with banana. y’all are so freaking cute. AAh, I can’t wait to watch these. Family in town and it’s a whirlwind but I promise I’ll watch as soon as I get the chance. But even sight unseen, let me give you props for getting over your camera-shy and say that you are so lucky to have a co-conspirator: sometimes teaming up is really what makes it happen. Exellent! I hope you enjoy our humble corner of the city! Btw…finally did the massaged kale thing this evening and LOVED it. Don’t know why it seemed so daunted before the tutorial but it was. DC welcomes you back from your Northern jaunts! Keep the videos coming! I’d love to see more easy, simple raw demonstrations as well as simple cooked vegan meals and such. This is wonderful! 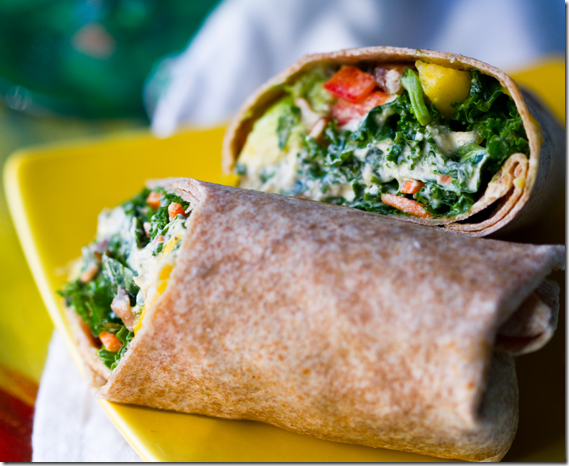 I love the idea of putting the salad into a wrap. This video is so fun – definitely keep making them. I have a question about the sesame miso dressing: because miso is a bit costly we rarely have it in the house. Do you think that I could substitute something in place of it. Ditto with the tahini. Thanks! I would love to see some demos on how to make quick easy vegan meals. 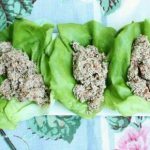 And I love the entertaining theme – dishes that are easy to prepare but tasty enough that vegans and non-vegans will love them. Ha! Since miso and tahini are the whole dressing, I think it would be folly to replace both, alas. But I have so many other dressings to try 🙂 Glad you liked the video! More videos please! Made my first foray into raw uncooking today with the massaged kale salad. Feeling pleasantly full and satisfied! Very informative and fun. I didn’t find you goofy. Very sweet and kind. I love the videos! great idea. I made the kale salad this evening. It was fabulous! I’ve been avoiding miso, because the idea of fermentation seems creepy to me, but I loved the dressing! I’m guessing there might be some health benefits in there too, and that’s all of the convincing I need 😉 Thanks, Gena! Great videos! You’ve probably heard this before, but you look a bit like Hillary Swank, so pretty! Love the idea of taking your aggression out on the poor unsuspecting kale. Can’t wait to make all of it! Ha, thanks! I do get that often, but don’t believe I’m worthy of the comparison. Wow, looks amazing!!! And you are so super cute. 🙂 What type of miso are you talking about, is it the paste in the jar? Last time I bought a jar I don’t think it even had 1/2 cup in it so I’m not sure if it’s the right one. Thanks so much!! Okay, I actually googled mellow white miso and found it! But when I did a location search there was no where near me that sold it. 🙁 Is it possible to sub with anything? I know miso is a unique taste. Thanks!! It is indeed very unique, Daphna, so it’ll be hard to replicate. Salt is the main flavor, but there’s also a thickness and creaminess. I’d try subbing tamari (maybe 1/4 cup) and replace agave with dates for thickness. Adorable video you guys!! 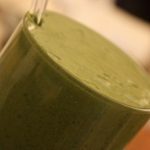 I love the real Gena at the end digging into the blender with a spoon– that would be me! I enjoyed the phantom outtakes as much as the parts you shared. 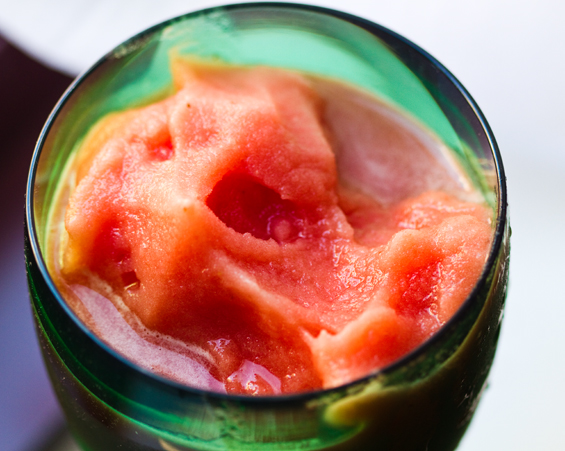 That slushy looks fantastic… watermelon is one of my favorite foods, so I need no coaxing to eat a ton of it- we’ll see if I have the patience to freeze and blend it :). I loved the massaging demo as well- I often skimp on that step and it’s soo worth doing well. The wrap also looks fantastic. Looking forward to more! I know you so much better now. Love the video. Your hair is growing out. I like it. BTW, I didn’t like watermelon as a child. I guess my taste buds needed to mature or something. Gena, this is AWESOME. It makes raw-cooking that much more accessible! It’s so easy! Made my new vegan (and ex-carnivore) friend a massaged kale salad (with 2 avos — I’m a growing boy and an athlete) and he couldn’t believe how absolutely hearty it was! Love the Kathy and Gena show 🙂 …and I really thought I knew how to wrap a wrap…but I really didn’t 😉 Thanks ladies; I look forward to the next episode! I really loved the videos! Great job! I can’t wait to see more videos! I enjoyed seeing you put together the massaged kale salad so I think a video on putting together different nurtrient dense salads would be neat. Maybe you guys could make a video on tips and tricks on prepping veggies (like when you showed how to quickly destem kale) or blender/food processor/juicer/dehydrator tips. Just some ideas! I’m just catching up on weekend blog reading so sorry to be repetitive but I really enjoyed the videos – and hope you guys do many more! It’s so fun to see you “live” and it definitely makes the food prep seem much easier! LOVED the videos! You are so funny and fun, Gena! This is so cool! I love the videos and am on the edge of my seat for the next one! I don’t know why, but I could have sworn that I’ve heard your voice before, but apparently not :). I think that since I read CR religiously, that I feel like I’ve actually heard your physical voice. So needless to say, I was surprised when you started talking and your voice didn’t sound the way I thought it did. Funny. I can’t wait to make that stellar dressing for my next kale salad, well, any salad for that matter. And being a huge watermelon fan, I’m just stoked that it’s summer and I can finally enjoy the beasts. The frosty looks amazing! Really I’ll watch any video you guys put together, but I think it would be informative to see some juice pulp videos. Love your video on this post. You guys are adorable and lovely same as the recipe you prepared for the demo. I hope you can write it up and make this recipe in an article article form. I guess this yummy salad has a great health benefits too. Thank you for sharing! gena, you are even more charming than i thought possible! lovely little video, and i can’t wait to see more! I loved them! 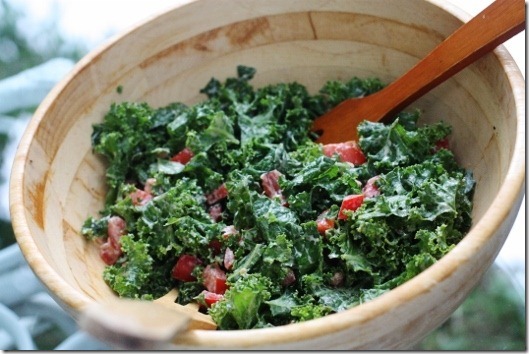 Great for a newbie like me, I’m craving kale salad now! 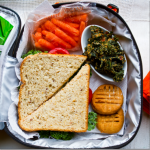 More healthy lunch and dinner ideas. I’m good on raw desserts they seem to be the biggest thing on the net. I need food! Gena- I just made your miso tahini dressing! I LOVE IT! I made a homemade version of a “buddha bowl” complete with quinoa, panfried tofu, cucumbers, roasted onion and a big handful of bean sprouts on top. I poured the dressing on and boy it was delicious! I will make it again and again! 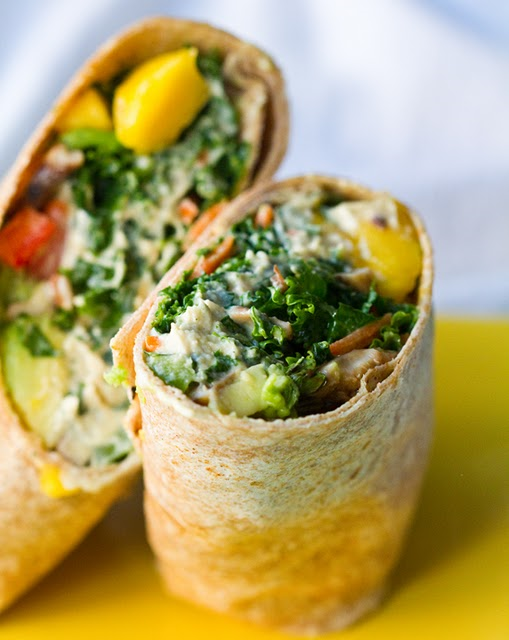 I just made these wraps for lunch, following your recipes to a T, and they were marvelous. I know I’ll make each of them again, and am already looking forward to hummus, round 2. Thanks! Hooray! So glad they were a hit. I LOVE the taste of kale, but I’m always afraid to cook with it. I’m super excited to see this salad and dressing recipe. I’m going to try both tomorrow! I found your site while searching for “ginger carrot coconut cashew soup” and I’m quite happy to have found it. I am a meat eater, but over the past year have earned a healthy respect for where that meat is coming from by raising my own chickens for food. After doing so – I’ve decided to try and source meat products from local and responsible farmers. I look forward to reading more of your blog and the thoughtful and interesting responses from your readers!